My dentist recently recommended new fillings and crowns on some of my back teeth. He also said the teeth were quite worn from my grinding habit. He recommended that the crowns be made of gold instead of porcelain, but I really don't want them to show and would prefer white teeth. Please explain the pros and cons of each? Gold Crowns: Usually a gold crown is used where cosmetics are not important. 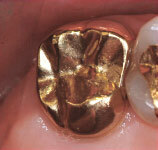 Gold crowns last the longest and wear the best. Porcelain-Fused-to-Metal Crowns: While this crown has metal below the porcelain, notice that a beautiful result can be obtained. All Porcelain Crowns: All porcelain crowns are very natural and beautiful in appearance and are gaining popularity as technology improves. First of all because you have a grinding habit, gold restorations are the preferable recommendation; as you will see in this review, they will last longer and wear better. Secondly, you may not need crowns. When your fillings are removed the teeth can be evaluated to see if there is enough tooth left to allow for a more conservative restoration. Options include “inlays” which are fillings placed inside the remaining tooth or “onlays” which cover and replace parts of lost tooth structure, and/or partial crowns. Whatever restorations your dentist determines are necessary, there are actually three types of materials commonly used for back teeth. Gold, which is still the treatment of choice; porcelain, which is unquestionably the most esthetic and a combination porcelain-fused-to metal (PFM) crown, which does not necessarily share the best of both worlds. Additionally, there are also newer ceramic (porcelain-like) materials that we will discuss later. Gold crowns are made of cast gold, a technique that has been in existence for over a hundred years and is the most successful. As aesthetics has become more of a factor, the use of gold is declining. Most dentists themselves prefer gold restorations for their own teeth knowing that they will serve well for several decades, in some case more than 50 years. Cast gold crowns have no match with regard to long-term service and minimal wear to opposing teeth, their greatest advantage. They may ultimately fail because of predictable wear of the metal through to underlying tooth structure and because of recurrent caries (decay). 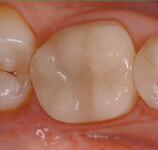 PFM crowns are relatively esthetic restorations that have been in use for more than 40 years. In one way, they combine the best of both worlds, a crown made of “precious or noble” metal (gold or platinum), which is strong, fits precisely and is bonded/cemented to the tooth. This metal substructure (beneath the porcelain) imparts strength and makes up for the porcelain's weakness and fracture potential. The downside — porcelain can badly abrade opposing teeth causing undue wear. PFM crowns have an “esthetic” longevity of about 10 years but can lose the stains applied to make them look natural over time, particularly if the gum tissues also recede. They have a “functional” longevity of about 20 years. Most common reasons for failure include occasional fracture of pieces of porcelain from the metal and recurrent decay on the margin areas (where they join to the natural tooth). A compromise between gold and porcelain fused to metal crowns would be a cast gold crown with a porcelain “facing” on the side for esthetics if needed. 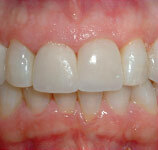 All porcelain crowns for posterior (back) teeth have been relatively unpredictable in terms of service and longevity. During the past decades, numerous all-ceramic (porcelain) crowns for back teeth have come and gone because of frequent failure. Without getting too technical, all dental porcelains are ceramics; variations of glass, fired in an oven at high temperatures in which the components fuse together. Their major advantage is aesthetics allowing incredible life-like appearance. Their major disadvantages — lack of strength, brittleness, and their potential to damage opposing teeth against which they bite. Like glass, there failure is “catastrophic” if they fracture making repair impossible. It is therefore difficult to predict their longevity, particularly because of the varied brands and materials used. Newer “pressed-ceramic” restorations and the computer-milled-ceramics, CAD-CAM systems have had reasonable service records initially and minimal failure when placed properly. Based on zirconium dioxide, “zirconia” substructures for these newer ceramic crowns are gaining popularity. Now one of the most studied yet newer materials to dentistry, a great deal of research is ongoing to improve their quality and durability. Their strength makes the prediction for their longevity promising, but as they say only time will tell. In summary, depending on the laboratory being used to fabricate the gold restorations, they tend to cost less per tooth than either porcelain or PFM crowns. How long the restorations last, will also depend upon your age, risk of further decay, your bite, and even the skill and experience of your dentist. Since you say that your teeth are already worn, and particularly if you have a clenching or grinding habit, you might also consider an occlusal (bite) guard to protect your teeth and your investment.